Few professions will grow as fast in the coming decades as teaching. Even fewer professions will be as rewarding and as significant to our society. If you are ready to make a real difference in the lives of children and youth, look to the Department of Education at Elmhurst College for inspiration and for the professional knowledge and experiences to prepare you for a challenging and vital profession. An education degree at Elmhurst College is about best practices that are grounded in research and theory. Our education undergraduates are highly sought after and their extensive school-based experience gives them a critical head start in the field. It also is about practical, hands-on experiences. 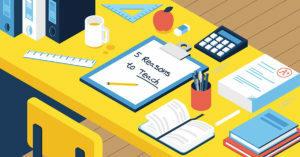 Future teachers are immersed in real-world applications in schools and practicing teachers are challenged to apply new ideas and best practices in their classrooms and schools. We offer 17 teacher education programs that lead to Illinois teacher licensure. Our graduates are teaching at every level throughout the United States and abroad. More than 1,700 Elmhurst alumni are teaching in Illinois schools alone. The Department of Education at Elmhurst College is committed to the preparation of knowledgeable and caring teachers for a global society. Through collaboration and diverse practice-centered experiences, we strive to prepare educators to be dedicated, ethical leaders in their learning communities. The Department’s mission statement describes qualities of teachers that all PK-12 students need: knowledgeable and caring teachers for our rapidly changing global society. Each undergraduate and graduate teacher education program integrates content specialization, professional knowledge, and practice-centered learning. Teacher preparation programs at Elmhurst College take place within the context of liberal education. For program candidates, this underscores the interdependence among theory, research, and practice, and positions our candidates to be advocates for students and leaders in our profession. Apply differentiation, evidence-based practices and assessments, and innovative technologies to meet the characteristics and needs of all students. Provide safe, caring classroom environments that demonstrate and encourage creative, engaged learning to become lifelong learners, critical thinkers, and responsible citizens. Founded in 1871 as a proseminary the College has a history of preparing students for lifetimes of professional achievement. As faculty of a college founded in the liberal arts tradition, we believe that all teachers should reflect a compassionate philosophical framework supported by strong theoretical and empirical knowledge of human learning and development and unwavering respect for human diversity. All teachers are responsible for demonstrating the highest levels of commitment to students and their families. Using a repertoire of teaching methods and technologies, every Elmhurst College teacher strives to promote love of life-long learning and responsible citizenship in our local and global communities. The values of the Department of Education at Elmhurst College provide the foundation for all of our professional interactions and teacher education programs. Collaboration. We value collaboration as the basis for developing and sustaining strong relationships with students, school partners, families, colleagues, and program alumni and alumnae. Integrity. We believe integrity is essential for continued growth and development of the members of our profession. Practice-centered Teaching and Learning. We value teaching and learning experiences grounded in research-based practices and real-world applications. Professional Excellence. We achieve excellence through on-going professional development, scholarship, and participation in collaborative learning communities. Elmhurst College is required to provide detailed information about accountability for programs that prepare teachers. These disclosures will assist students and their families in making informed enrollment decisions. Prof. Deb Meyer covers everything education in this new blog.